Mike Burchett was quietly introduced as an offensive analyst for the Cougars late last week. He comes to Houston after a one-year stint as offensive coordinator at Fordham. More importantly, Burchett’s history with Dana Holgorsen goes back 8 years as a player, graduate assistant, and an analyst. In the offensive analyst role, Burchett will not be an ordinary low-level support staffer. Instead, he will be involved in game-planning and will serve as an extension of the brain trust on the offensive side of the ball. Burchett’s history with Dana Holgorsen goes back 8 years as a player, graduate assistant, and an analyst. The analyst role is suited for film and stat junkies. The job requires an ability to identify patterns and opponent tendencies. How does a defense usually set up on 3rd and 3? What sets do they run on first down in the red zone? How many different blitzes have they shown on the plus-side of the field this season? It’s the perfect job for a coach with a degree in mathematical economics (which Burchett received from Kentucky). Mathematical economics is about creating models to predict future economic activity – tools that can be transferred to the football field. Burchett stated his career as a preferred walk-on QB at Kentucky in 2010. He then transferred to WVU and was the back-up QB during the 2011 the Orange Bowl championship season (Dana’s first season) and in 2012. At WVU, Burchett was also coached by new UH offensive assistant Shannon Dawson. Dawson was WR coach during Burchett’s first year and OC in his second. After two seasons at WVU, Burchett transferred back to Kentucky to finish his degree and work as a student assistant and then a GA under OC Neal Brown. When Brown left, Dawson was hired as Kentucky’s offensive coordinator in 2015 and tried to keep Burchett as a GA. Burchett chose to head back to West Virginia where he was a GA for two seasons and an offensive analyst in 2017. As a GA in Morgantown, he was responsible for working with WVU’s quarterbacks. He assisted in developing the passing plan for games and conducted drills and meetings with the QBs. Holgorsen served as his own OC and QB coach but depended heavily on Burchett. He was the QB coach but without the title. 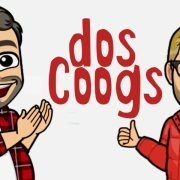 GoCoogs.com Premium: Get a year of Insider Access for just $49.99. Subscribe today! 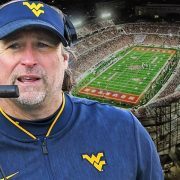 “He’s a bright, bright young coach and he’ll be leaned on to drill the quarterbacks, which he does a great job with,” Holgorsen relayed to the Register-Herald in 2015. As an offensive analyst in 2017, Burchett self-scouted the Mountaineer offense looking for ways that opposing defensive coordinators would attack it. He also put together scouting reports on opponents, charted offensive stats in practices, and helped with on-campus recruiting. I’d expect his role at Houston to look very similar. 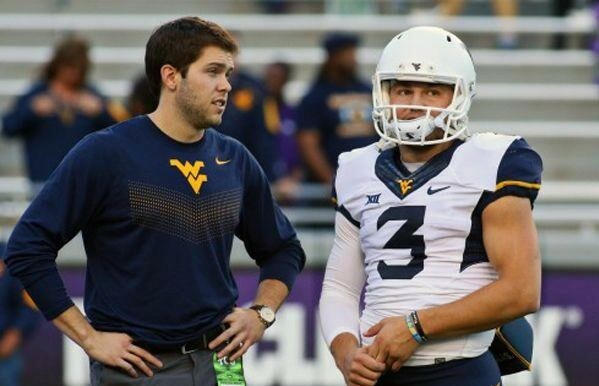 Dana Holgorsen has helped mold Burchett’s young career, treating him as a coach during his playing days, working to get him the student assistant role at Kentucky, and then bringing him back to Morgantown. Now, he’s able to pluck Burchett from an FCS coordinator job to add him as another set of eyes on the offense. 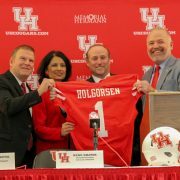 UH’s commitment to fund the football staff at record levels allowed Dana to hire an experienced coach that won’t count against UH’s 10 on-field assistants. 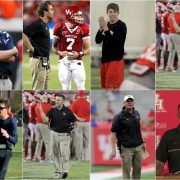 It’s another indicator of how much importance Dana places on the QB position: Burchett is now the fourth UH staffer that has coached QBs in the last few seasons. What did you think of this profile?